Ninja Profits System Review – Is Ninja Profits System Scam? TrianaSoft Software Review – Is TrianaSoft Scam Or Legit? Hello, and welcome to this Power Lead System Review. Today let us look into the main question; Is Power Lead System A Scam? As usual, I will provide all the information that I have gathered together so that you may get the answer to this very important question that you are here querying. NOTE: I am not a member of the Power Lead System so I am not promoting it to you. I am already a member of a legitimate system that does work and has been online since 2005. 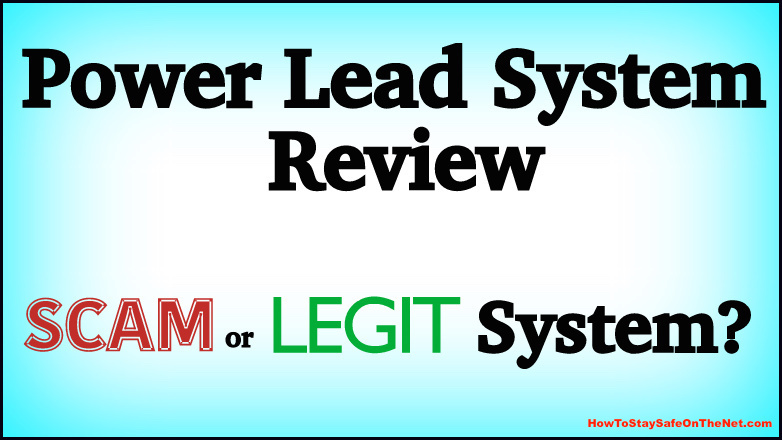 I am doing this review as I know that you are searching for a legitimate way to earn some income online, so I want to give my honest opinion on the Power Lead System, and if it will be a good opportunity for you. If you are a member of the Power Lead System, I would encourage you to share your story with us, within the comments section. We would like to get as much insider information as possible so that all who read this may get some benefit. As a side note; Rob Force is not the owner as some may believe, but rather is an avid promoter of the Power Lead System. Neil Guess is an internet marketer based out of Tacoma in the state of Washington and obviously co-owner of the Power Lead System. I did not find much information on his business profile to give more information to you. I will update this review once more information becomes available. Michael Price is best known as the founder/CEO of PricelessPossibilities.com and for being a former trainer for the Tony Robbins Research International. I would say that he is the one with the more experience of the two owners. How Long Has The Power Lead System (PLR) been in operation? The PLR system website has been around since 2013, according to a Whois website lookup. It is a relatively new program in the internet marketing/MLM niche, so you would have to give them some time to prove their worth online. Is there a cost for the Power Lead System? There is a free version which is available for 7 days which is nice; this is something that I always recommend to my readers when they are looking for an earning opportunity online (try before you buy systems). However, you will not get as much value from the free version as you would if you were a paid member. The Power Lead System has been branded as an “all-in-one” marketing platform, which includes a vast amount of features. It is powered by the same pricelesspossibilities.com website by the same Michael Price whom I mentioned earlier. The Power Lead System is said to provide entrepreneurs with the necessary tools to grow their businesses, therefore making more sales. Entrepreneurs are also able to promote the business of their choosing. The system is based mostly on setting up a lead capture page that will lead potential clients to the sales page; once they enter their email address into the opt-in box. Potential clients will be led to the Power Lead System and at that time, you will have the potential to make a sale. How Is Money Made Within The Power Lead System? Since Power Lead System is operating under an MLM structure, you will make money from every other sale that you make. Your recruiter will be earning money from half of the people that you refer to join the company. As an example, suppose you were to refer 4 people to the PLS system. You would earn for yourself $40 from 2 recruits. The other $40 would go to the person who referred you to join in the first place. So, therefore, you earn $20 per every other sale made. Personally, I am not a big fan of this structure. If you happen to be comfortable with using this method, do not let me deter you from signing up. I, however, prefer to earn my full commission as an affiliate marketer by promoting any items and making the full profit, not sharing it with my up-line. For a much clearer explanation on MLM, I would suggest you take a look at what Wikipedia had to say about it. Is Power Lead System Genuine? The Power Lead System is a genuine system as far as I can see. There is actual training on how to implement what you have learned. A system is in place for you to see some form of success once you follow through with the training videos and texts. This is not something that I am able to say with most of the scam sites that I have reviewed in the past. So for this aspect, the Power Lead System gets a pass. I am happy to say that the Power Lead System does have a support system available, however, it will take up to 24 hours to get a reply since you will have to submit a ticket. Most likely, there will be others in line with a problem, so you would just have to wait your turn until you get a reply. The live weekly webinars on Google Hangout have some valuable information contained within them. There is an affiliate program. (promote and earn). Training to get sales, buying traffic, generating traffic, etc. It’s an MLM program. MLM programs have a very negative reputation in internet marketing arena. When You consider a very well known MLM scam site like the empower network (review), you will get a much clearer picture of the not so good reputation. Promotion of a get rich quick dream (unrealistic earning potential) to lure people in. This is something that I wrote about in my “how to spot a scam website” post. I simply do no like this tactic. I think that a program should not promise people that they will be making “x” amount of money as if it is a guarantee that they will definitely earn it. The Power Lead System is not the worst program that I have seen to make money online. It is not a scam program that takes your money and you never see them again. As mentioned earlier, the only aspect that I would consider a bit off is the promise of riches to lure people in to buy their product. Neil Guess & Michael Price have created something of value that some may learn from, even though it is an MLM opportunity. I do not recommend MLM simply because the people at the bottom of the pyramid will not be earning fully from the system. Once again, I prefer if the playing field is level for each individual to truly earn from. For this reason, the Power Lead System is not totally recommended! People with some knowledge of internet marketing will, however, find a bit of value from it. At this time, I would like to say a big thank you to YOU for taking your time to read my Power Lead System Review. I hope that you found it informative and helpful. This will enable you to make a good decision. I would appreciate it if you would leave a comment below with your questions or feedback. Your voice will make a difference. I would also like to say special thank you to Kyle and Carson @ Wealthy Affiliate for providing me with the correct tools, training, and community that have allowed me to make a change in this world through internet marketing. You guys are truly making a big difference for anyone who wants to create a full-time living online. I honestly believe that Wealthy Affiliate sets the standard by which all Affiliate Marketing training platform should be measured. I can safely say that places like the Power Lead System do not even come close to what is offered within the community of Wealthy Affiliate. Anyone (Newbie or advanced) can profit from it in so many ways. Thank you! As always, I ask that you stay safe on the net, and wishing you a lot of success while you go along your online journey. i find it a little “odd” that all the reviews against Lead Lightning and their sister, Power Lead System are from Wealthy Affiliate members. This is proof that the SEO ranking methods taught inside Wealthy Affiliate does really work. And can we able to earn with free membership. Please pass the details and info to this mail. I think you have done a ‘bang up’ job on this review, it is very well planned and executed, giving detailed but not complicated information on the whole program. I have to say from the start that I really don’t like MLM scheme because they all suffer from the usual flaws right. Common amongst these schemes are the charges made by the owners. Now I understand you when you say this program is not a scam because it delivers training etc, and I believe that. But what I can not forgive is the business acumen that forces an affiliate to pay for the privilege of promoting their product. This is an outrage and should be stamped out. So, Jason, the bottom line is I agree with everything you have written, but I have slightly stronger feelings towards these programs. Above all, thanks for a cracking review and a great presentation. Thank you for your honest comment, Carl. I like taking my time to give detailed reviews on a product. I want you and others to get the full facts which will then enable you to make an informed decision. I know that the MLM structure does not have the best reputation in the business, yet still people do earn with it. I personally do not endorse them, as I think they have done a lot of damage to so many people over the years. Ethical affiliate marketing is what I truly endorse and I will be doing it for as long as I can.